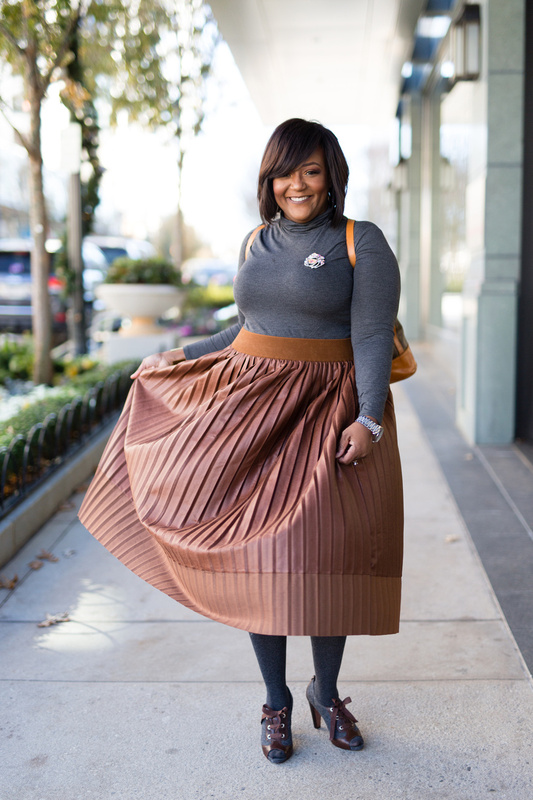 Pleated skirts aren’t just for preppy school girls anymore, and as we head into the cold season, they certainly aren’t just to be worn in the spring and summer. In the spring of 2016, pleated skirts in all textures, colors and sizes (mini, midi and maxi) made their resurgence on the fashion scene and on runways world wide. And because I am such a lover of Gucci, it was the luxury brand’s offerings of logo-printed, metallic fabrics and whimsical colors that really made me take notice of the 1950s retro elegance of these garments. And currently, I am OBSESSED. There are so many ways to style this trendy, but classic, skirt that the possibilities are almost limitless. For the fall and winter, you can wear with a chunky knit sweater or long sleeve tee and moto jacket. When the mercury rises, why not take the same skirt and pair with a tee and your favorite sneakers? That’s three different examples right there! 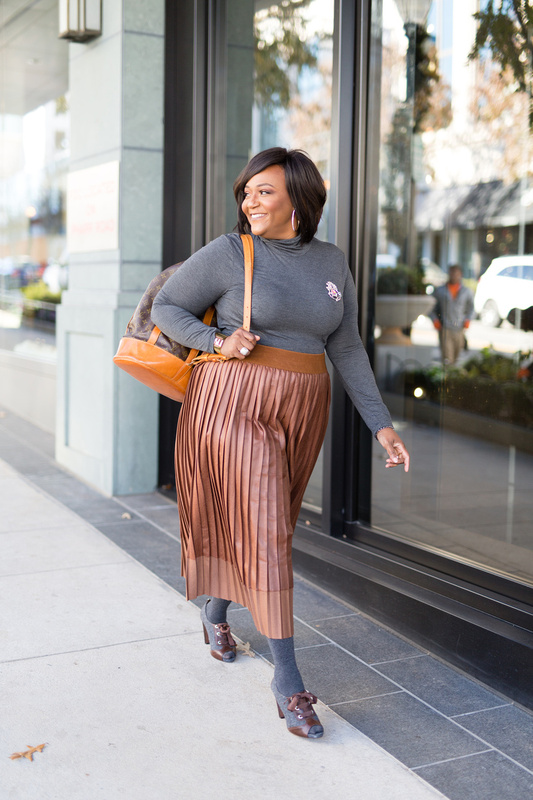 Here, I paired this faux leather pleated skirt with a grey long-sleeved turtle neck (cheaper option here) grey tights and grey and brown open toe, lace up booties (an alternative here). In fact, I actually built this entire look around the booties. I have had them for more than 12 years and had never EVER worn them before these pictures were taken. I just wasn’t quite sure what worked well with them. 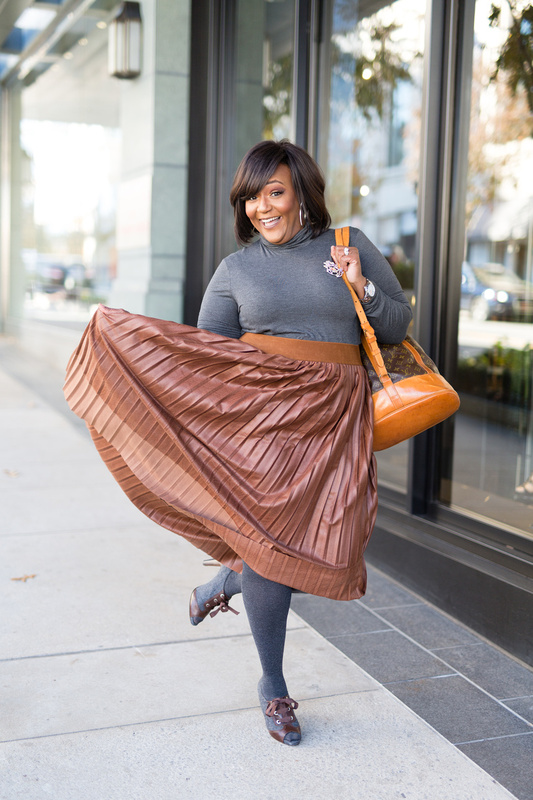 Once I purchased this skirt, I knew I could pair it with the shoes and a grey top. I added the brooch for a hint of glam. Keep reading to get this skirt for under $40! Let’s talk about this BAG! 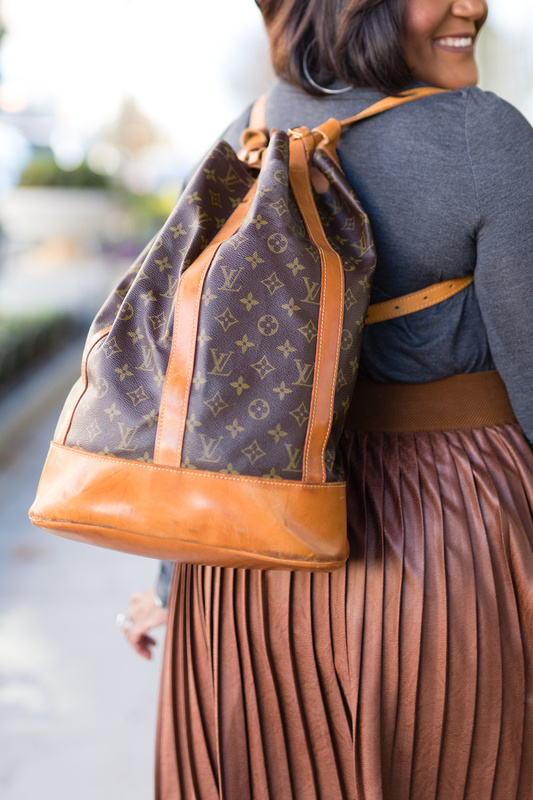 I snatched up this vintage monogram Louis Vuitton Randonnee shoulder bag from A Second Chance, one of my favorite luxury retail consignment shops located in New York City. It was really a steal at $500. Louis Vuitton discontinued this very popular bag some years ago but it is still a LV loyalists favorite. 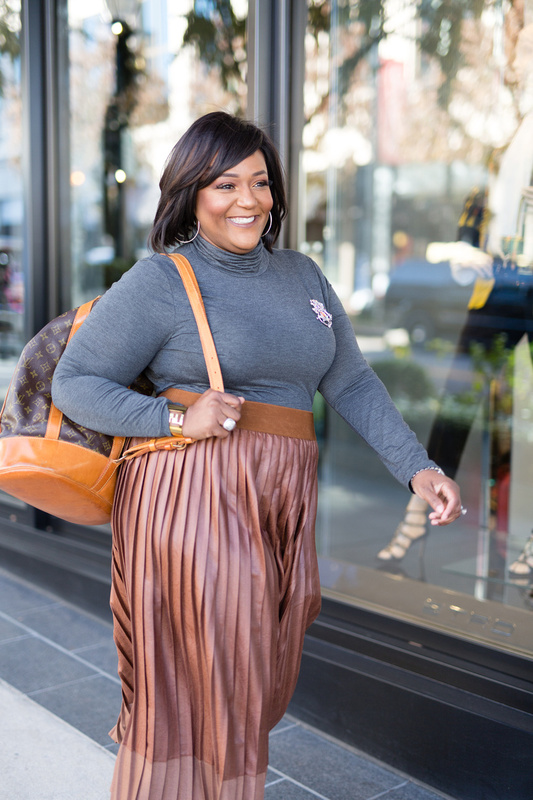 When I walked into A Second Chance and saw it on the shelf, I just knew it was going home with me, and the price tag was in my budget for a great vintage designer bag! This look is just fun, on trend and an instant classic in my book! Have you tried the pleated skirt trend? 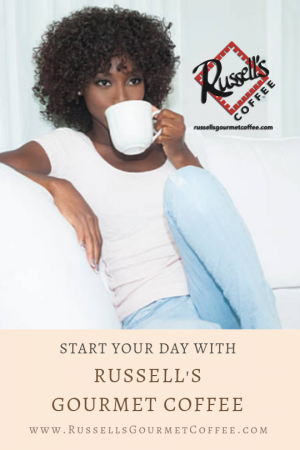 If not, were you inspired by this post to try one? 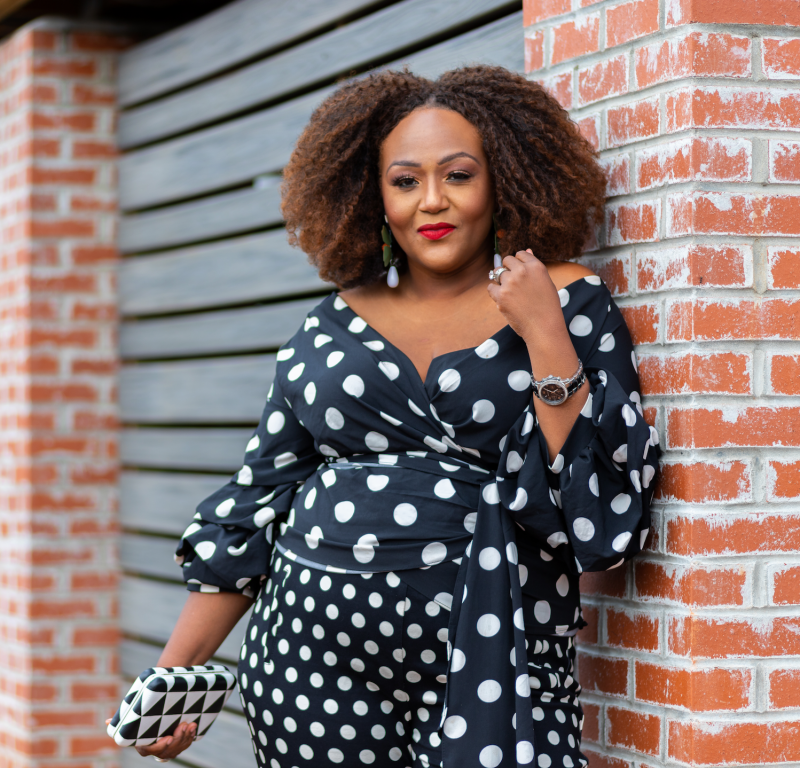 If you like the one I’m wearing in the post, get it here for under $40 Share your looks with me! 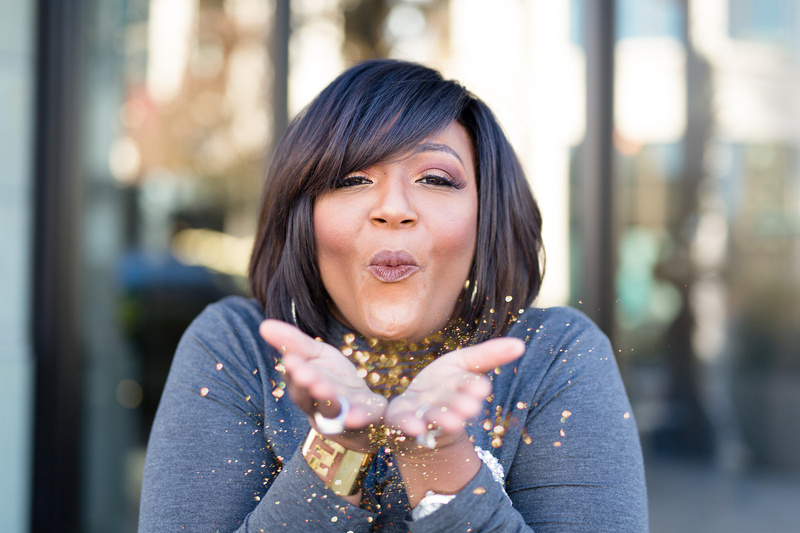 As always, thanks for stopping by and I love to hear from the #Freehive!